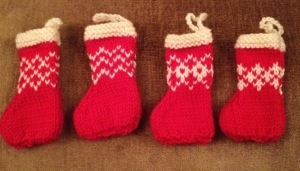 Over Christmas I simply couldn’t have knitted or sewn to save my life. The whole family was down with a flu bug, and whilst we all rallied for The Day long enough to open gifts, cook the delicious meal cooked by The Hubby, and sip a therapeutic glass of prosecco or 2 (or 3! ), the rest of the holidays was spent doing some very serious lounging about and recuperating. Thankfully, I’d recently purchased a delightful embroidery kit from Jenny Blair on Etsy. I can’t even remember where I first stumbled across Jenny, but when I saw this design I was entranced. The two squirrels that live at the bottom of our garden (whom we’ve named Fred and Ginger, of course! ), are an endless source of glee, and this just seemed the perfect project for our home. Jenny was a joy to purchase from. The design is screen printed onto fabric, all ready to sew, but the colours she had on her site didn’t go with our decor. A quick convo and she’d found the perfect fabric and we were good to go. Shipping was so prompt and I had embroidery thread and a hoop in my stash. 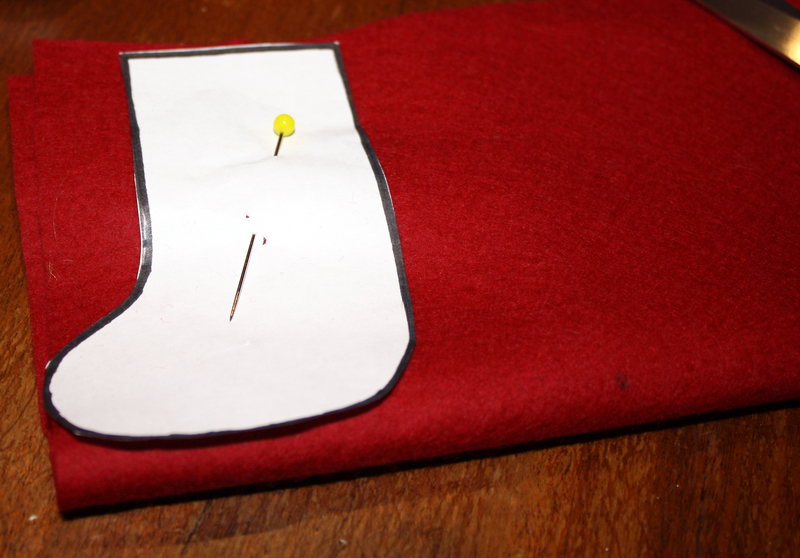 So I was all ready to go when the lurgy hit, and a little quiet stitching was all I could muster. This design in done in four simple, basic embroidery stitches and is easy to make up, even if you’re a beginner. Once completed I just re-stretched the fabric in the hoop, secured with magic tape, and taped a circle of felt to the back, ready to hang. It’s so sweet and I’m really pleased with the result. You all know my friend Liz…she of the mad knit seaming skills who always rescues me from that onerous task. Well she’s be working on another project that is altogether more fun. So much so that I begged her to let me share the finished product with you because….well, you’ll see. The base is this plain calico dog from Hobbycraft, although you could, if you were so inclined, make your own base. The decoration is, of course, simply a fabulous collection of clothing labels hand stitched to the base. I cannot tell you how much I covet this wee dog. It such a simple but genius idea and the result is just adorable. I suppose a more sewing inspired version could be made using fabric selvedges. Hmmm…perhaps I should start collecting them! ….and the living is busy! So much going on here. The kids are on holiday from school now for 7 weeks. Already we have a playdate with friends and sleepovers at grandparents planned. A week at playscheme will be a good break for all of us, as will spending the last week with friends in Bedford. It’s hard to believe but when they go back in September Button will be in juniors. Needless to say everyone is tired. Boy threw the mother of all tantrums this morning and after 3 hours (I kid ye not) of yelling and stamping and tears and throwing toys around the place he’s finally asleep. Button is enjoying the respite as much as I. Things will settle soon after a few days of chillin’. Husband and I are shattered as, despite not completing the reno on this house, we’re thinking the best option might actually be to move! I know….it was totally outta the blue for us too. But our current home is teeny tiny with a garden the size of a postage stamp. After a recent visit to our friends in Bedford and their half acre garden, Button would stand at our bedroom window wistfully wishing that we could knock the fence down between us and our neighbours. Add in that we have need of a home office and a dedicated sewing room and only one small room that could eventually be argued over and we decided it’s time. Trying to sew, eat and run a business from the kitchen table is getting old! We’ve spent the last few weeks looking at everything on the market that remotely fitted the bill. We think we may have found the ideal candidate. There’s another interested buyer so we may lose out…time will tell. I’ll let you know as things develop. So, as you’d expect, there’s not much creativity happening here. This is Brooklyn Tweed’s Longfellow by Michele Wang which I’m knitting in Drops Alpaca in Navy (colour 5575) for Hubby. Mine will be red leather. That should keep me occupied over the holidays. I’m hoping to get a little time at the machine too. I’ve two lots of fabric for shirts for Boy and the yellow blouse is going to be remade for Button. I’m planning a version of her Liberty blouse, this time with a pleated front as per her request. I think it will suit her more than me! I also have a couple of makes that need photographing. Perhaps we’ll have a day of nice weather soon and we can get out and about with the camera. Priority for the next 7 weeks, though, is picnics and playing in the park. Reading and drawing. Visits to the zoo and museums. Playdates and pyjama days. Pretty much taking the days as they come. Hopefully without too many meltdowns! Either theirs or mine! So posting will sporadic…I’m sure you’ll understand. In the meantime I’m off to do some colouring with a small girl. I’ll see you soon. Way back in the summer I promised the local library that I’d do a “talk” at their December coffee morning on some, at that point undecided but definitely sewing related, subject. It was months and months until December at that point and so, obviously, I forgot all about it until a few weeks ago when they reminded me. Cut to this evening. 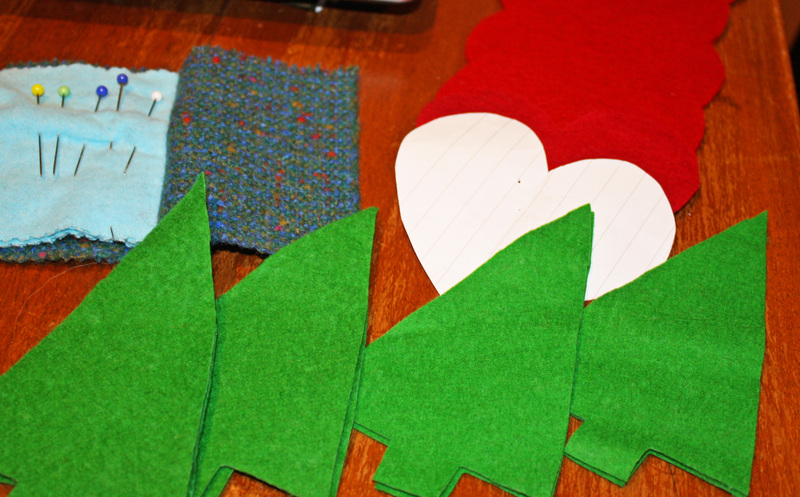 Although I’d planned that I’d talk the ladies through making some very simple felt Christmas decorations, and I’d collected together all the materials I’d need, I’d not actually done anything with them. 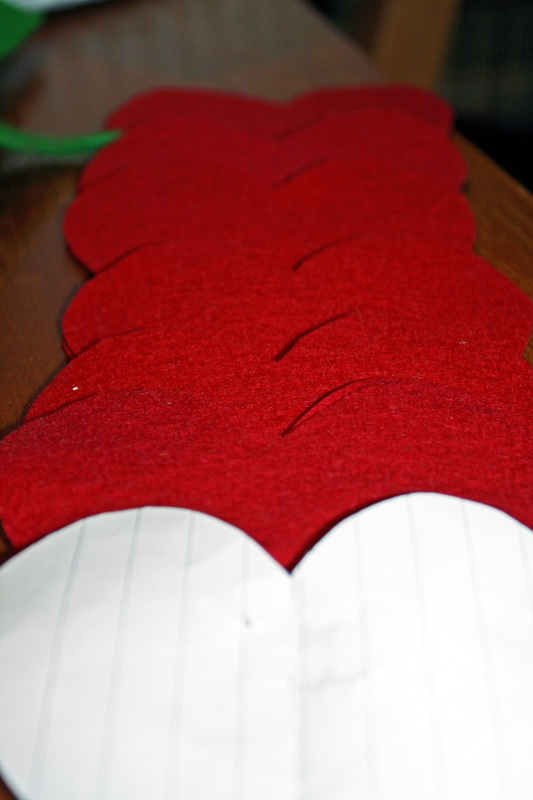 So I’ve been drawing simple shapes, cutting some of them out and packing a small box to take with me tomorrow. This stocking, however, is for another project altogether. 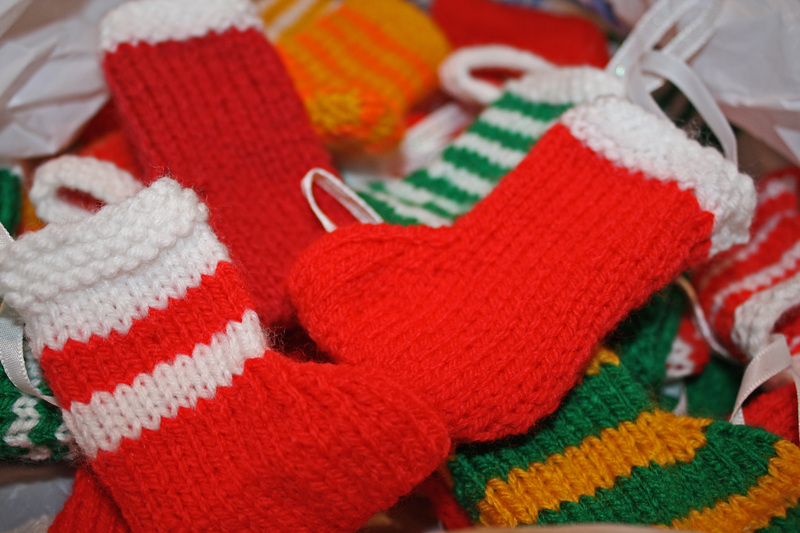 One of The Husband’s colleagues is, Jude, a craft blogger who is knitting up a storm, making little stockings, which she is planning to fill with chocolate and sell for charity. All monies raised will be sent to The NIHR / WT Children’s Clinical Research Facility and the AT Society. When she asked me if I’d be willing to help out a little, of course I said yes. And promptly volunteered Ma as well! I, on the other hand, am characteristically tardy, but will, on my return from the library tomorrow, crack on and get my contribution done. With such good causes at stake I really need not to let the side down. So I have preparation for my final exam to do. And the kids have brought home back-to-school-lurgy so I’ve been feeling quite a bit under par this week. So, of course, I’ve been making a dress for Button. And not just any old dress…no! 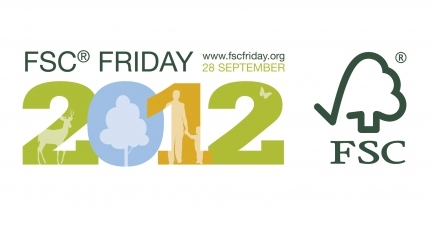 A forest themed dress for FSC Friday! 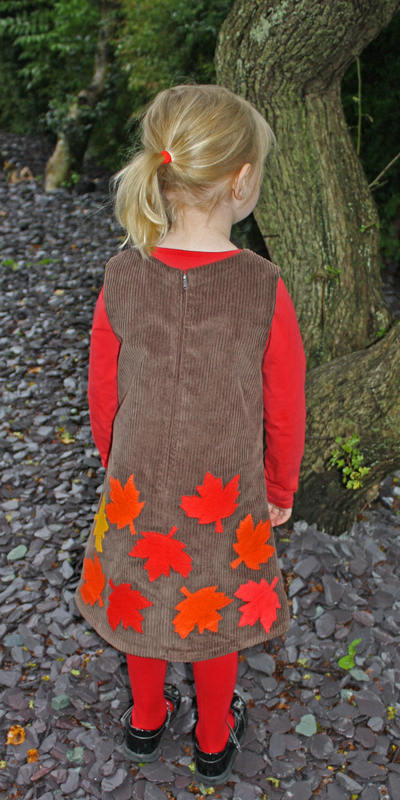 When school told us that today the children could go dressed in green instead of uniform, or in something forest themed, I first planned to do a quick dress out of cord to represent the tree with a few felt leaves tacked to it! 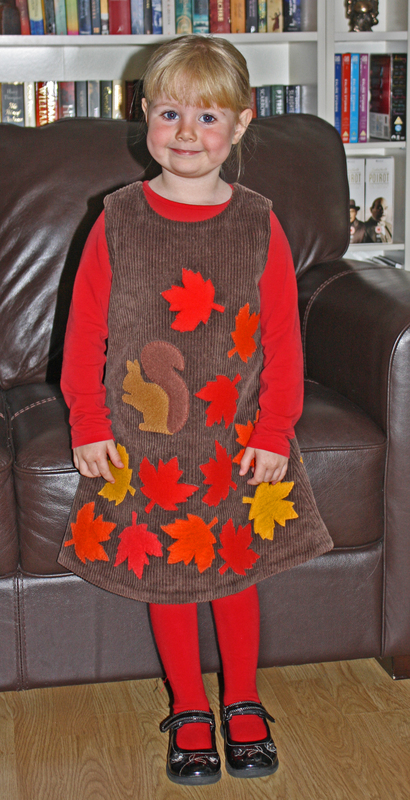 These leaves are all properly appliquéd onto the dress…by hand! Thanks to the lovely Liz for letting me raid her felt stash! I must be mad. I swear I need to learn to leave well alone. But this has gone from being a one off costume to a little dress she can wear all winter. And a self drafted one to boot. Because you know that the leaves go round to the back of the dress too. Yep…I did…I’m crazy! Even more so when you consider that that is a hand picked zip. It was so worth it though to see her face light up as she saw it coming together, for the ecstatic thank yous, and the bear hug and face full of kisses she bestowed. I forget the credit for the squirrel appliqué ..I do apologise. I sourced this from Wee Folk Art and you can download it here.